( 5 rooms) and save up to $2000 per group. Tropical paradise, warm breezes over azure seas, encompasses you; your body and spirt melt into the nature of things! Wow! Now let’s enjoy the water sports, gourmet meals, evening entertainment and let’s Party! 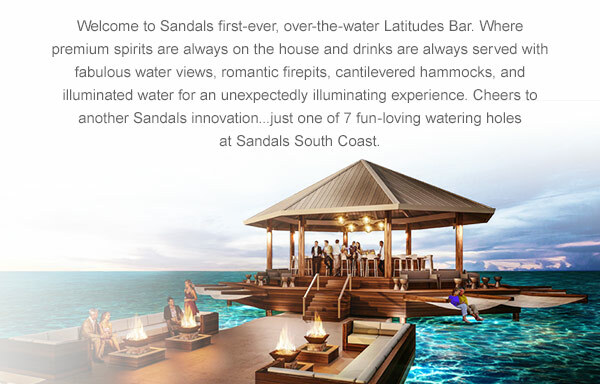 Sandals South Coast, formerly Sandals Whitehouse has been reborn. 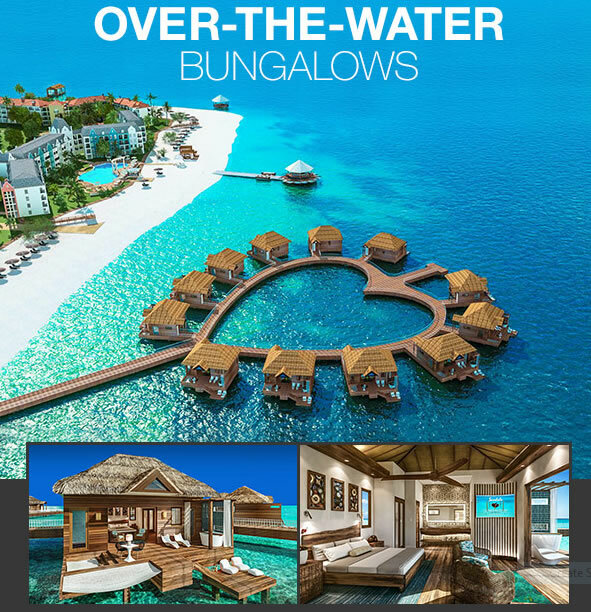 12 Over the water bungalows are now available. We are taking registration for these over the water bungalows at the South Coast. We are also able to offer you Sandals Royal Caribbean, now available for those romantic evenings in a bungalow over the Azure waters of the Caribbean. Dreaming where your Wedding will be, now, you do not have to dream about it. 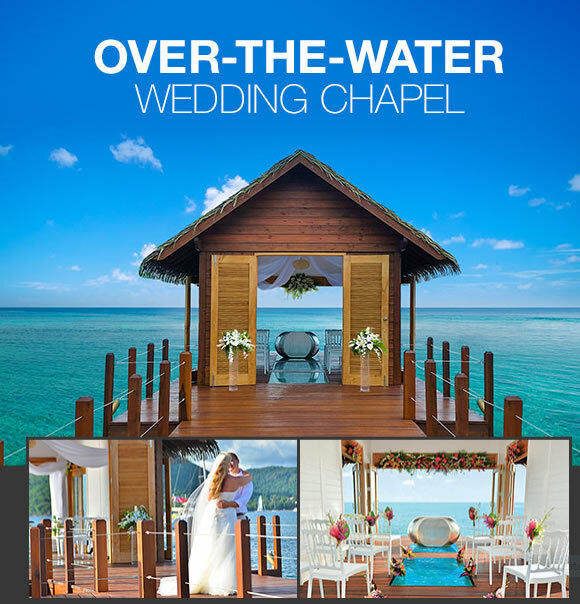 New Over-the Water Wedding Chapel at Sandals South Coast in Jamaica has what you dream about. Full circle panoramic views of the Caribbean, walk out to the Chapel on a beautiful pier where you then walk on a glass floor aisle. You are walking on water for your special day. Now available. Offers are valid now until further notice and unless otherwise specified. Subject to change without notice. Book a land only or air-inclusive Luxury Included® vacation at select Sandals Resorts and get the same credit and offers!! Buying your airline tickets elsewhere? No problem! You get an instant credit when you book the land-only portion of your vacation online - Savings are automatically applied to your final price. Applicable to US Bookings and Canadian Bookings. Not available at all resorts , offers vary by Resort, advance booking of package required.
. e-mail Travelmart. . Privacy Statement. The Travelmart Ltd., 5913-162 A. ave. NW, Edmonton, Ab. T5Y 2W2 Canada, 780-487-1034 1-888-462-2628, Celebrating our 32nd Anniversary planning Travel and Vacations .